Trailing four runs in the bottom of the ninth inning, it was apparent the Yankees were already thinking about room service. Koji Uehara, the Boston relief pitcher, barely needed the free-swinging help to extend his personal equivalent of a perfect game from 11 innings to 12 on just nine pitches. The 37 straight batters Uehara retired is a club record, and I saw the last one, in person, on Friday the 13th. Just about every feature of the moment is reproducible in the medium where I ordinarily consume baseball—MLB The Show on the PlayStation 3—with a big exception: How Uehara got the opportunity for such a milestone in the first place. Uehara was a starting pitcher in Japan—he's the third Sawamura Award winner to pitch for the Red Sox, which has to be some kind of record now that I think of it. When he opted to come stateside, that is the career path he chose with Baltimore, where he and his family still maintain a residence during the season. Bad luck in 2009 turned into his good fortune this year. Injuries sent Uehara to the bullpen for 2010, and made him trade-able to Texas the following year, and to Boston where he was given an unglamorous relief assignment at the beginning of the year. When Joel Hanrahan and Andrew Bailey, both former All-Stars (and Bailey the 2009 Rookie of the Year) pulled up lame, Uehara got his second bite at the apple as the Red Sox closer. All sports video games feature some sort of advancement out of a depth chart, and injuries also are a part of a long season. But the games never convert your position or change your role unilaterally based on these factors, even if that happens all the time in the leagues they mimic. The most drastic thing I've ever had happen to me is an unexpected trade, occuring just once, in MLB the Show. Some games, such as the MLB 2K series, take that possibility off of the table outright. This is because, as sports video gamers, we're doing something Uehara isn't: We're paying to play. It's a job for him. It's a $60 piece of entertainment for us, and for that kind of money, a player who wants to be Boston's left fielder or No. 1 starter is damn well entitled to it, even if his talents are better applied elsewhere. It's not that sports video games cannot make that judgment. It's that such a decision is the fundamental breaking point between a results-oriented professional sports enterprise and a have-it-your-way athletic fantasy. And no matter how much they advertise the realism of the former, sports video game makers are selling the latter. Always. Just to be sure I checked with Sony San Diego, makers of The Show. A user-controlled pitcher on the Road to the Show roleplaying fantasy mode gets moved permanently to the bullpen in one of two ways—either he designates himself as a closer when he creates the player, or he asks for a role change later in his career. As a pitcher advances early in his career, he'll move from a lower team's rotation to the bullpen in a higher classification. But it takes a minor league demotion to be knocked out of that role. Madden NFL offers three paths for a created player in its Connected Franchise mode: a high draft pick, a late-round pick, and an undrafted player. High picks have better starting attributes, while undrafted players are imbued with a superstar development trait, meant to assure an out-of-nowhere story. In NBA 2K's career mode, you'll begin as a late first-round pick, with the potential to improve your draft position with a breakout game. But when you sit down with a GM looking at drafting you after that game, they never ask if you're willing to move from shooting guard to small forward. They just ask if you're OK riding the pine behind whatever depth they already have at the position. NCAA Football won't unilaterally switch your position but it will let you, as a coach, reassign players' positions in the offseason, which is particularly handy if you've recruited, say, a bunch of tackles but have a weakness at guard, or need to get talented linebackers on the field in a scheme change. Again, such a change is all up to you. NCAA Football will also let you play on both sides of the ball in your high school career, and field scholarship offers for both positions. And I've created 60-minute players at fullback and middle linebacker in Dynasty. Once you choose your starting role in college, however, there is no going back. But switching a baseball player from pitcher to hitter or vice versa—as has been seen with Smokey Joe Wood, Bob Lemon, Rick Ankiel and one George Herman Ruth—I don't think that's anywhere near the realm of possibility in a console baseball game. The career arc of a sports video game is fundamentally front-loaded. You choose an idealized outcome and define your success by it—whether that's a championship in a single season or becoming the greatest of all time at a single position. 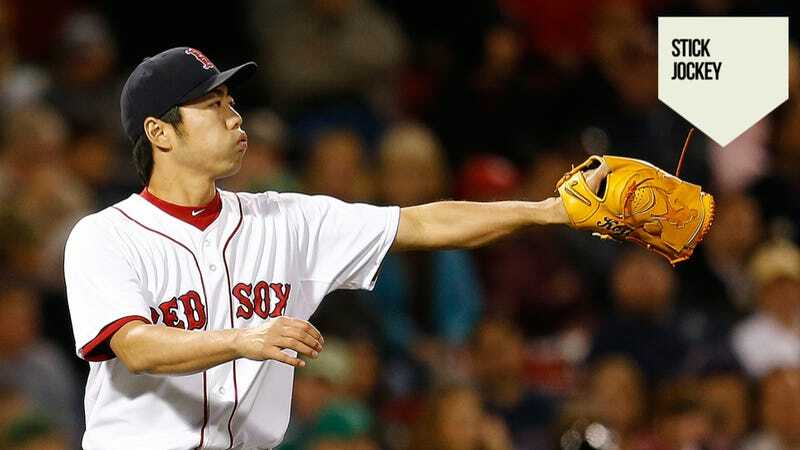 With the ability and prerogative to restart, players aren't likely to explore the kind of happenstance career paths that have taken Koji Uehara from a role player to a pitcher destined for numerous Fox Sports closeups in the late innings of the coming postseason.